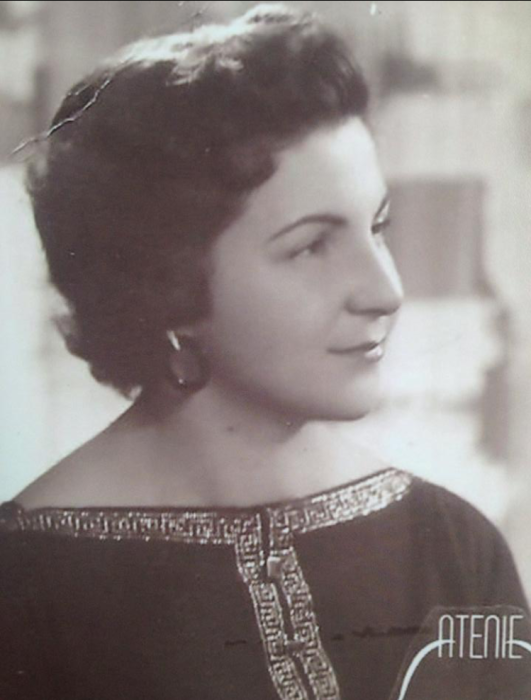 Pauline (Pagonis) Fafoutis was born on Sept 10, 1929 in Krokilio, Greece. Pauline was raised in a loving home by her parents, Mr. Tom Pagonis and Mrs. Georgia Pagonis. At the age of 17 she moved from Greece to Canada with her family. After an arranged marriage to Fontas Fafoutis, they moved to Minnesota where they started their family. In 1964, she moved to Greeley, Colorado where they owned and operated FONTAS PIZZA for nearly 40 years. Pauline earned her business degree from Aims Community College in 1967 while raising 3 children, staying active in her church while operating the successful restaurant. Pauline loved to cook, was an avid Bronco fan, stayed extremely up to date on current events and was prideful in everything she accomplished. Her greatest love was her family. In 2003, Pauline suffered a severe stroke leaving her partially paralyzed and the inability to speak or write. Her two daughters, Dessie and Gina, have been caring for her, in their respective homes, until end of life. Some of the memories over the last 16 years, that Dessie and Gina would like to share, include how she “lit-up” when her grandchildren (Dimitri and Lexi) walked in a room; watching Gold Rush on Friday nights with her son-in-law, Mike; a special handshake created with her son-in-law, Steve and the millions of kisses and laughs shared with Dessie and Gina on a daily basis. Pauline is survived by her three children; Steve Fafoutis (wife, Olympia Fafoutis) of Baltimore Maryland, Dessie Fafoutis (husband, Steve Owen) of Highlands Ranch, Colorado, Gina Shryack (husband, Mike Shryack) of Highlands Ranch, Colorado and four grandchildren, Dimitri Shryack, Lexi Shryack, Anastasia Fafoutis and Leo Fafoutis. She is preceded by her siblings Gus Pagonis, Tony Pagonis and Effie Voulgaris. The funeral service will be held at 11:00 a.m. on Wednesday, January 30, 2019 at St. Catherine’s Greek Orthodox Church, 5555 South Yosemite Street, Greenwood Village, CO 80111. Burial will be at Linn Grove Cemetery in Greeley, Colorado immediately following the funeral service.